These past weeks have been crazy busy with finishing work in school, saying goodbyes, packing up 2 years of accumulated textile ephemera and trying to store everything in smart places before me and my boyfriend get access to our new apartment in august. I had planned to post some concluding things about my time at Capellagården, some pictures of the exhibition etc. but time has really been to scarce. Now me and N (the boyfriend) are heading out on a month long backpacking trip in southern Europe, so here will be quiet for a while and the textile life will be put on hold. Although I could not help bringing some crochet for the trainride...crochet because my precious knitpro sticks might be too fragile for a backpack. :).Maybe I'll find some interesting textiles on the way, if so, you'll see them on my instagram @elinakelius. Over and out until july! 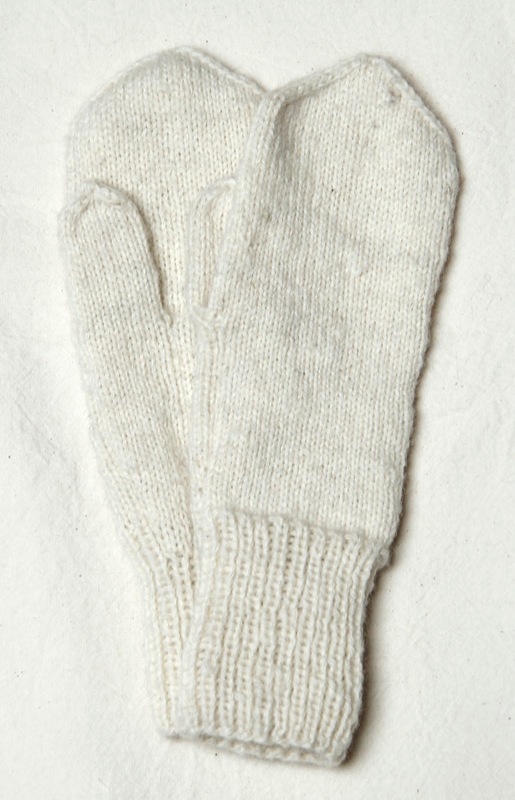 Yarn: Mitten- unknown 2 ply wool yarn, dyed with onion peel and white Tuna filtgarn from Borgs vävgarner. Cuff – brown 2-ply wool yarn that I recieved as a present (made from Värmland sheep!) and grey 2 ply wool yarn from Filtmakeriet. Needle size 2.5 mm. I am very fond of simple geometrical shapes, like squares. The colour yellow is also a favourite. 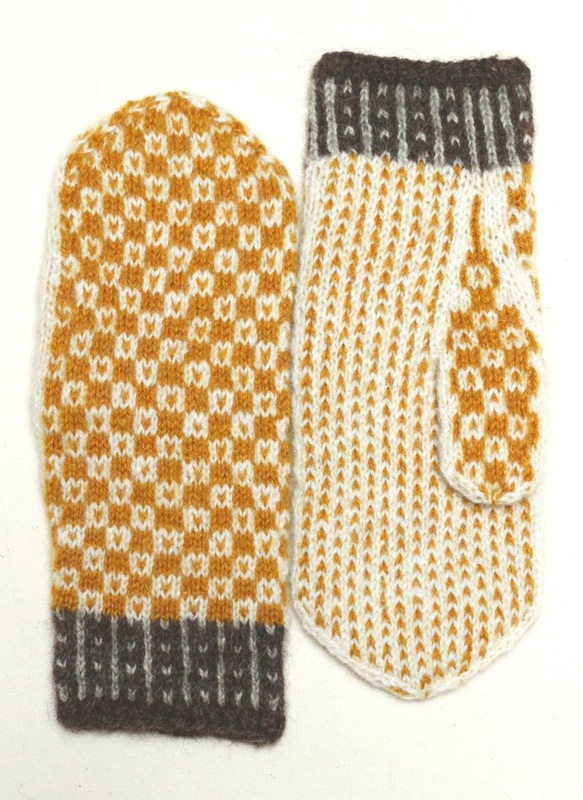 Here I wanted to combine them into a simple, easy-to-knit pattern. They were the last I had time to make for this project and also, I think, my personal favourite! Yarn: Random two ply wool yarns. Yellow- tansy, goldenrod and oak. Beige – velvet roll rim, orange – blood red webcap, green – tansy on grey yarn. Needle size 2.5 mm. When you like to experiment with dyeing, you rather soon end up with lots of small balls of yarn that are almost to tiny to use. Here I try different yellows and beiges in a pattern inspired by a flowering meadow. If I work more on this pattern, I think I will change the 'inside' - I am not completely satisfied with the stripes. These days I always light-test my natural dyeing experiments, but the scraps I used in this project are old and I don't really don't know what will happen. 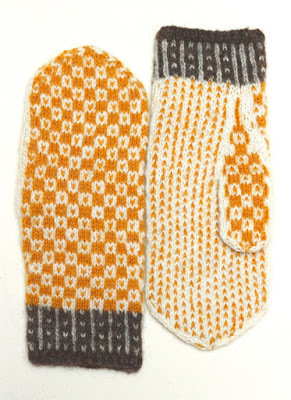 I will get the full picture first after the mittens have been used. In anything changes - I will post! Yarn: Three-ply white wool yarn from Ullcentrum Öland, dyed with indigo after knitting. Needle size 2.5 mm. enough to not damage the wool. 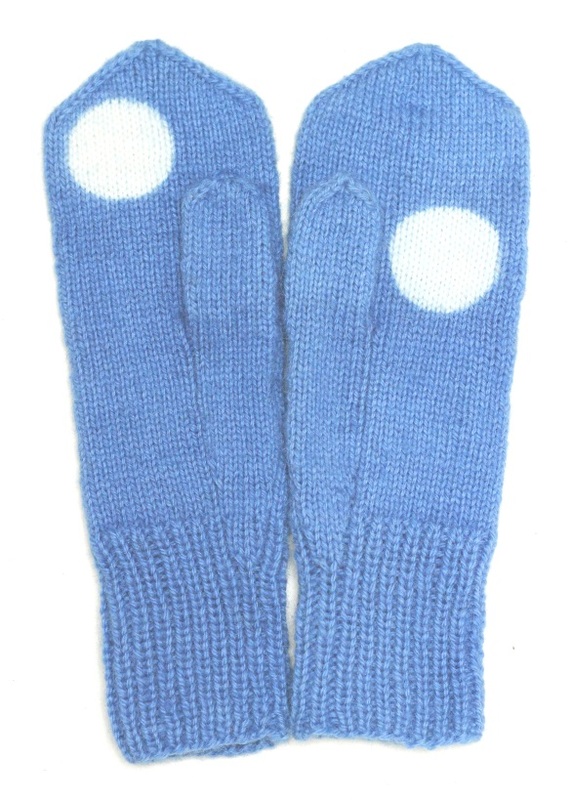 The mittens were dipped twice, but only for five minutes each, to cause as little damage as possible (low pH in a indigo vat is around 8-9, and that can still be bad for the wool if it is in the vat for a long time). The white moons were created with a clamp resist, and I really like that they became so exact, like a print. Yarn: Three ply white wool yarn from Ullcentrum Öland ullgarn dyed with madder after knitting. Needle size 2.5 mm. Sometimes one just want to make something really simple. 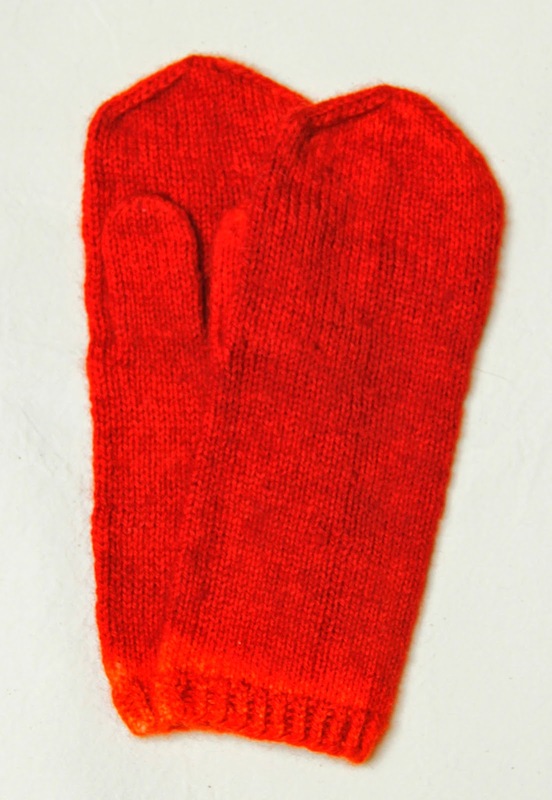 I had been knitting so much with two colours, and thinking so much about floats and construction problems that I really longed for making a simple one colour mitten. I choose a three ply yarn so the mittens would not be so thin. 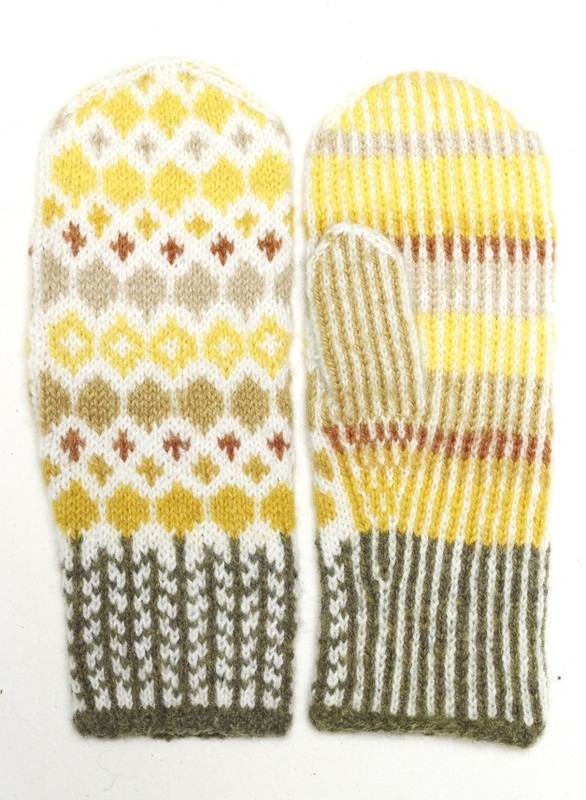 After knitting, I dyed them with madder – a small experiment with dyeing a ready made garment. It took two dips to make the colour really even. They really are crazy red and I love them! Yarn: Filtmakeriets klassiska ullgarn (Filtmakeriet's classic wool yarn), 2 ply natural white and dark greyish brown. Cast on edge in madder and indigo dyed pieces of yarn. Needle size 2.5 mm. Last year I discovered the wonderful yarn from lovely small scale wool producers Filtmakeriet, but I never found time to knit with it until now (the dark yarn in my Sållväv shawl is the same as the dark in these mittens, but single). It turned out to be a lovely yarn to knit with, full of grease! The pattern is a development from the previous one, where the squares go crazy. I like the look, but it was horrible to knit, and did not block so well (I'll redo it as soon as I get them back from the exhibition). I also had to knit the first mitten twice, because I totally miscalculated when I cast on. 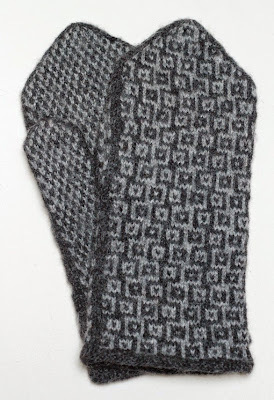 I had planned for a thumb with a wedged increase (like in the Mirrored flowers mittens) but I cast on really late at night and totally forgot that the thumb stitches are created as you increase during knitting, thus making the wedge. I cast on all stitches from the beginning, and didn't notice anything peculiar (other than that the mitten seemed very big) until it was time to bind off (se picture below) and I had 13 extra stitches on the inside of the mitten. I frogged it, and angrily finished it at double speed, with a normal straight thumb so I did not have to re knit the cuff. The yarn Is lovely though, I will definitely use it more in the future! 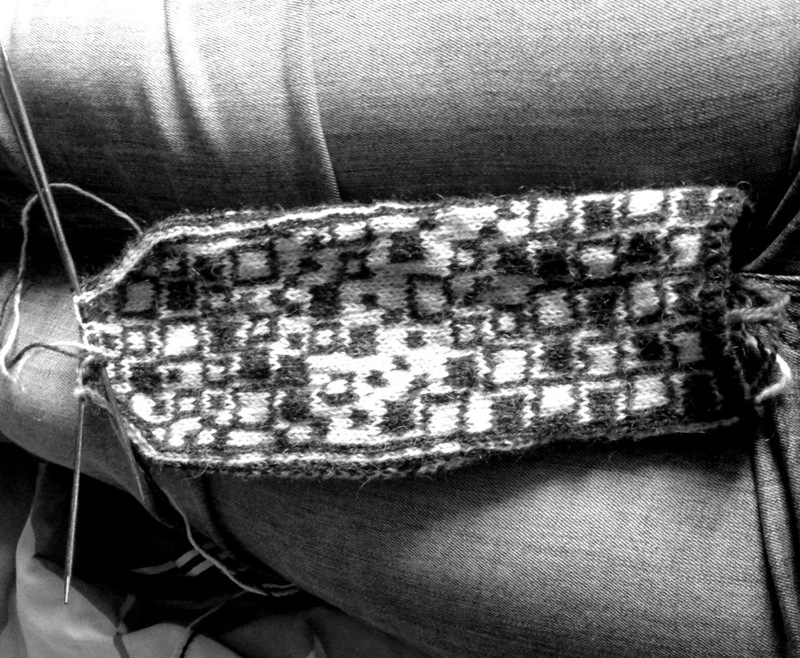 Yarn: Kampes 2-trådiga ullgarn(2 ply wool yarn from Kampes) in antracite gray and gray. Needle size 3 mm. 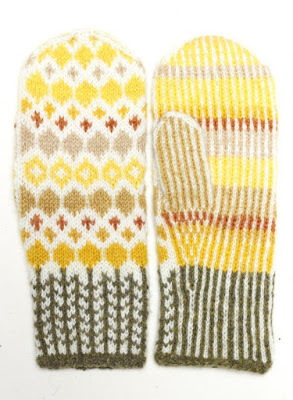 These were knit for my partner who really needed a new pair of mittens. He wanted muted colours and a geometric pattern. I took the opportunity to develop a men's size. 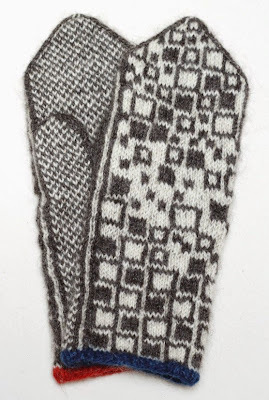 I already had a pattern (see picture below) that I created for Capellagården's participation in the Swedish charity event "Musikhjälpen" autumn 2014 (Serious request in other countries) and I choose to work a bit further on that. 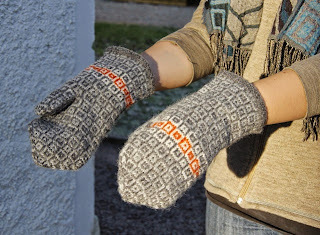 My name is Elin and I make textiles. I also love nature more than the average person and I enjoy a good cup of tea. Textile is my homeground, but really, I'm up to most things crafty, if it is inspiring enough. My current place is Väjö, southern Sweden.